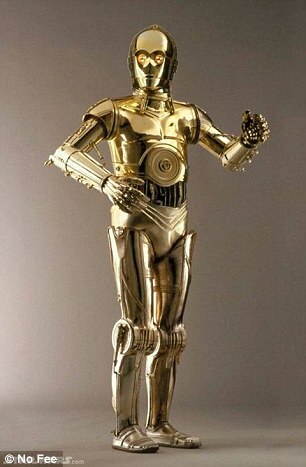 Ocado plans to wheel out Star Wars-style C-3PO humanoid robots at its warehouses as early as 2025. The ‘SecondHands’ robots will pass spanners and move ladders to workers using artificial intelligence and speech recognition. IS OCADO REMOVING HUMAN WORKERS? Ocado delivers groceries for both Morrisons and Waitrose in the UK, and has invested millions of pounds into developing home delivery technology for global grocery retailers. Its newest depot in Andover, Hampshire, uses hundreds of robots to move boxes of groceries stored in a giant grid. The firm’s work with automated warehouse systems, including SecondHands, has led to worries it is phasing out human employees. An Ocado spokesperson told MailOnline: ‘The idea of SecondHands is not to replace people, it is to take away an element of a technician’s job that is physically demanding, boring or unpleasant. The SecondHands prototype resembles Star Wars android C-3PO, but with wheels at its base instead of legs. It is designed to assist human engineers looking after Ocado’s handling systems using AI to predict workers’ needs. The robot listens to commands and interprets human reactions to decide how to help in different situations. Workers can call out instructions, such as ‘pick up that spanner’ or ‘hold this for me’, and the robot responds with the appropriate action. 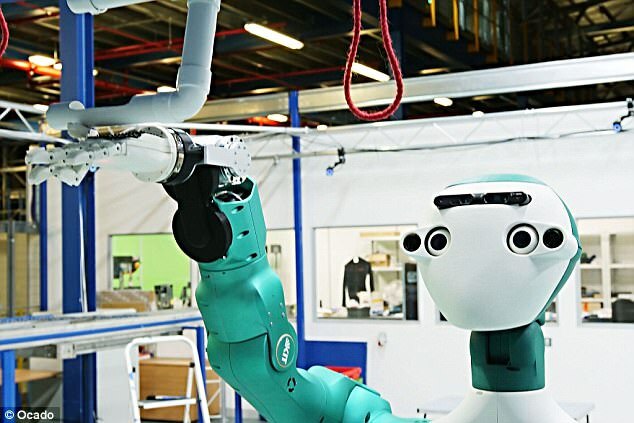 According to Ocado, the robot ‘learns through observation’ to take on jobs that require a level of precision or strength unmatched by human workers. An Ocado spokesperson told MailOnline that the android’s development will complete in 2020, with the project’s £6.2 million ($8.4 million) cost provided by an EU funding board. 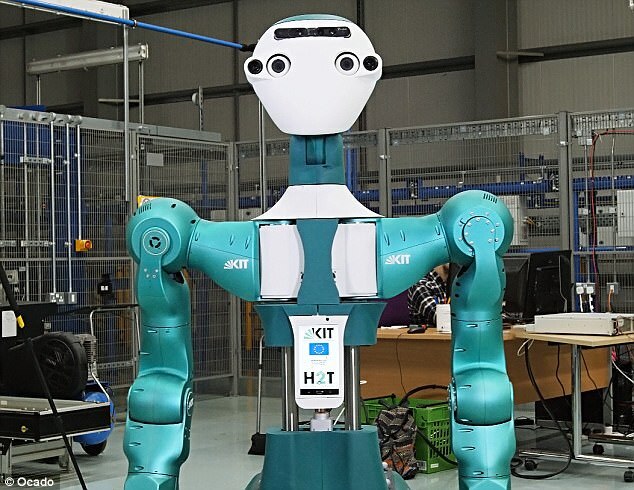 SecondHands robots could be installed into Ocado warehouses as early as 2025, the spokesperson said. SecondHands was developed at the Institute for Anthropomatics and Robotics at the Karlsruhe Institute of Technology (KIT), in southern Germany. Ocado is now working with experts at University College London, Switzerland’s Ecole Polytechnique Fédérale de Lausanne and Sapienza University in Rome to further develop systems that recognise human actions and speech. Ocado delivers groceries for both Morrisons and Waitrose in the UK, and has invested millions of pounds in developing home delivery technology for global grocery retailers. The firm is currently building a robotic warehouse for French supermarket Groupe Casino as part of a huge international deal. Ocado is also developing robots that can recognise and grip a range of products, from delicate eggs to toxic bottles of bleach.